A New York professor is suing Cambridge Analytica, the data company that got kicked off Facebook over the weekend. A New York professor is suing data company Cambridge Analytica to figure out what it knows about him. The data firm and its parent company, Strategic Communication Laboratories, came under scrutiny over the weekend after Facebook suspended them both. 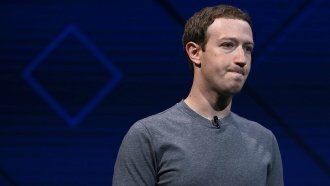 Facebook says Cambridge Analytica improperly gathered data and didn't get rid of it after a request from Facebook. David Carroll teaches at the New School in New York City. He says he tried to get the data firm to tell him last year what it knew about him and that the company produced a file including predictions about his values and how he felt about issues like gun rights, education and health care. But Carroll didn't think the company would be able to make all those predictions from simple demographics. He filed a request in the U.K. to get a court order saying Cambridge Analytica has to hand over all the information it has on Carroll and explain where that information came from. Cambridge Analytica worked with the Trump campaign in 2016. Carroll says he thinks the information the company has and the way it was used may have affected the way he participated in the 2016 election cycle. For its part, Cambridge Analytica said in December, before the suit was filed, that Carroll's claims are unfounded and that it follows all data protection laws.